Julie at Damn Good Vintage sent me this link, to a pattern at MOMSpatterns. Isn't it cute? Wait, let me rephrase that. Isn't it CUUUUUUTE? However, I can tell you from many tries at sewing necklines with a hard square edge that you are going to have to either add piping or interface the heck out of that sucker. Seriously. Ignore my weirding prophecy at your peril. Otherwise it WILL curl up, and you will either have to accept the curling as an aleatoric design element, or you will be sneaking off to the ladies' room to wet it down so that it lies flat. Either way, it requires a fair amount of dedication. perhaps she is in the corner because she forgot to wear a contrasting belt like all the other girls…such a mistake can cause mortal embarrassment. royal blue fabric red and or white buttonswhite gloves gros grain somewhere in thereaiming for Sailor KateThat’s not pouting, it’s nefarious plotting. Awesome pattern! I don’t think it would have some of the square neck issues you mentioned. The neckline itself is a scoop, and the squared off elements are the shoulder seams extended into closurs. Should be fun to sew. Crisp! Clean lines! Buttons! Lovely! I remember those side zippers. Looks like a HomeEc project for school to me. Lovely pattern. She’s standing in the corner with her soggy neckline because SHE DIDN’T LISTEN NOW DID SHE?I’ve read somewhere that if you make the lining just a hair smaller than the top layer all around you won’t have as much issue with curlage. You will notice that even a sundress rates lady-like gloves. Not pouting, flirting… there’s a handsome rich ad exec to the right of the envelope and she’s batting her eyes at him (Somebody’s been watching too much Mad Men)Mine would be plaid with the little shoulder flaps cut on the bias. Very nice pattern. They are going to go smack her with the paper I think… no gloves, not contrasting belt, tsk.BTW, your comment counter isn’t working. My post looks like #8 yet it only says you have two comments. She’s pouting coz she made the mortal mistake of making her dress in that weird mustard-no-wait-celery color.Thanks and glad you guys like the pattern! Love it! 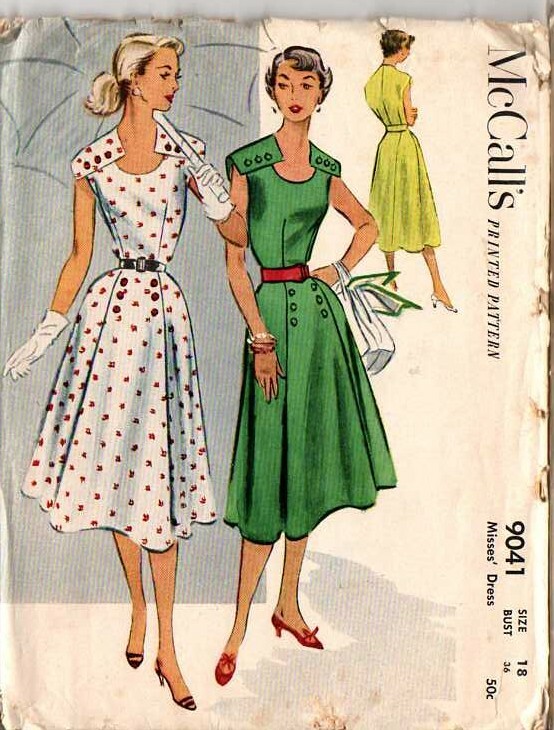 I would go for a navy blue with white polka dot print- adding red piping and buttons- and wearing it with red shoes.OR black with pink polka dots and pink piping, belt- and wearing it with black shoes with fabric bows made to match. You know, Erin – one of the things that really puts Dressaday way ahead is the use of words like aleatoric. You’ve singlehandedly brought back the use of the dictionary. Hear, hear!! The lady on the left is asking Green Dress Lady what Yellow Dress did that was so bad. Green Dress said, “Oh, don’t you know?” and then proceeded to tell the most salacious (and terribly untrue) rumours about Yellow Dress.Yeah, those square shoulder thingies would be need to be interfaced. But what’s worrying me is getting all the corners sharp, precise, and all the same. Oh, black with pink piping and pink buttons. I got the perfect ones at an estate sale last weekend, pink and they look like the buttons you find on Swirl dresses.Too cute.and that pattern is Uber!cute. Ooh fun. In my imaginary world where corners stay flat and in place, I’d work this piece in a border print of some sort and run that border across the hem and across those plackets at the shoulders. I have some super-cool orange buttons from France that I’ve had for years because I bought them without A Plan. I know I’m talking to the wrong crowd, because y’all believe in The Stash, but I just don’t have the space for that. So I would carry my buttons to the fabric store and pick some nice solid – turquoise maybe, or pale yellow, or even just nice heavy white linen. Fun to dream. . . The Mustard Lady is waiting for her Olive Green belt to be dropped off by her husband. Little does she know that, as she waits, Colonel Mustard is in dire trouble …As for me? White guipure lace, with a shell pink lining, black velvet flaps, black velvet belt with pearl-and-gold buckle, and huge pearl-and-gold buttons. OK, first let me catch my breath. wowI’d do it in navy with yellow buttons, and belt.BTW the chick in yellow is scolding her daughter, who is just off envelope, for stealing her blue belt. Ohhh…a yummy chocolate brown with either turquoise or baby pink buttons and belt….and maybe a hint of pink lace somewhere…the lower neckline..???? I am choosing to believe that while Yellow has a self-belt, she has a FANTASTIC huge belt buckle on the front.I’d make it in…black silk taffeta with rhinestone buttons, a black belt, and a big sparkly brooch at the center, I think, as an interesting party dress.And in striped seersucker with big white buttons. Yes, oxanna! How do you get those corners sharp? Mine are always kind of roundish; no matter how hard I clip and trim and poke. Rebecca: I alway stop a couple stitches short of the corner liek Rhoda said, adn then stitch one or two stitches on teh diagonal (45 degrees for math geeks). this gives me lovely sharp points on collars and the like. Hey thanks, you guys! I’m on my way to buy my new birthday Bernina. Whoo-hoo! I’ll make sure its first project contains lots of corners. Yep, i totally agree. The green one is just plain gorgeous! !